On a somewhat regular basis the Federal Trade Commission also known as the FTC provides a list of information that they have been compiling. 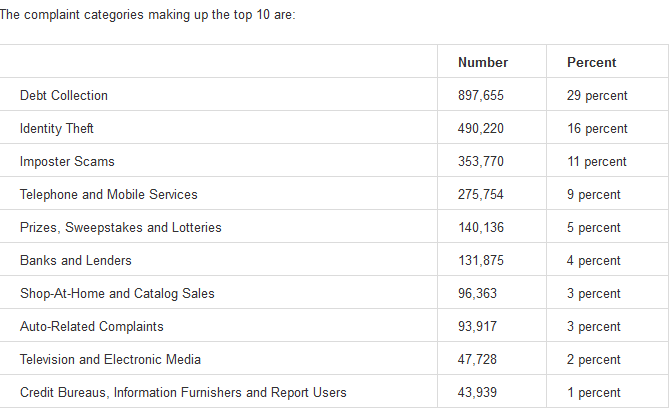 Specifically, they provided a list of the top ten consumer complaints according to complaints that they have received from consumers. 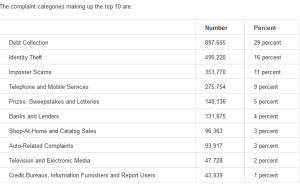 As can be seen, debt collection identity thefts are the top two complaints. These are complaints that consumers have complained about to the Federal Trade Commission. The Federal Trade Commission then will take these complaints and make investigations. Sometimes the Federal Trade Commission will then file lawsuits and issue orders and sometimes they do not. The Federal Trade Commission has a website contained therein the numerous investigations complaints which they are taken and pursued under the authority of the federal government. Obviously, debt collectors are one of their top targets. The issues with debt collectors are frequently harassing and deceptive collecting techniques. The list is extensive and only a minimal sampling of the overall consumer complaints in the country as each state has their own equivalent of the FTC or Federal Trade Commission that investigates complaints on their own. As an example, New Jersey, there is the division of consumer affairs that takes a complaints file suit and investigates various deceptive advertising and deceptive sales techniques. The division of consumer affairs is trust with enforcing consumer rights and the New Jersey Consumer Fraud Act against businesses that are utilizing deceptive techniques. This government agency can institute a lawsuit and recover money and pay back to consumers as its role as a governmental agency. It would be a reasonable assumption to assume that the state agencies had a similar reporting to the federal agencies on common fraud and deceptive practices. I would be relatively certain that the collection is a issue on the state level as well as the federal level. The same would be true of identity theft. It is well-known that identity theft that various criminal entities millions or billions of dollars by trading on stolen identities and creating various identities notice synthetic identities. The criminal enterprises that use these identities to improperly obtained monies. Sometimes they just sell the identities or the synthetic identities.